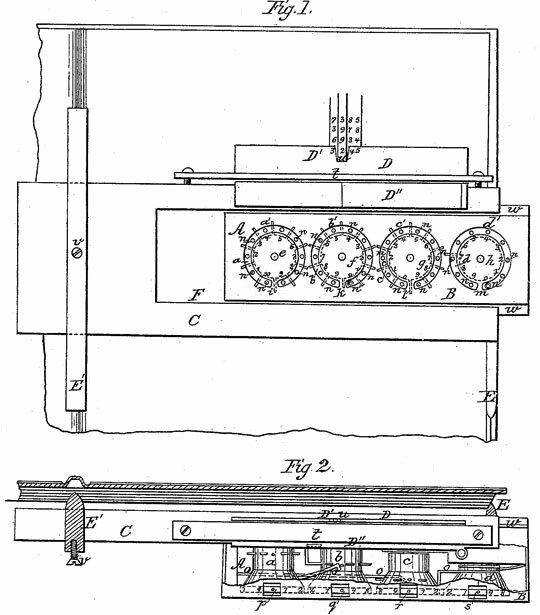 Thomas T. Strode from Coatesville, Chester county, Pennsylvania, took out three patents for calculating devices—US30264 from 1860 for an adding machine of Calculating Clock and Pascaline type, and two patents for circular stylus-operated adding machines (US49168 from 1865 and US74170 from 1868). The adding machine from the first patent is a pin operated 4 (or more) wheels device. Each of the wheels is provided with 10 teeth and a carrying tooth (of course, leftmost wheel doesn't have carrying tooth). Numbers are entered into the device by inserting a pin into the circular plate of the corresponding wheel and rotating until the pin strikes the connecting strip. There is not a zeroing mechanism provided, so the wheels must be zeroed manually. The last patent of Strode (US74170) is for circular stylus-operated adding device, the patent model of which survived to our time, and is kept in the collection of National Museum of American History, Washington (see the lower image). It is a wood, paper and metal device, with overall measurements: 1.8 cm x 16.7 cm x 26 cm. The outer edge of the paddle is divided clockwise into marked in ink 100 parts. 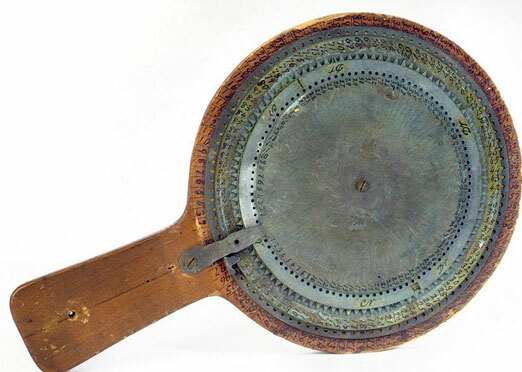 Five concentric metal discs (held together at the middle by a screw) are atop the paddle, each one slightly smaller than the one below. The first disc above the paddle has 100 holes around the edge and rotates. The second disc is fixed, with the numbers from 1 to 97 marked in pen counterclockwise around the edge (a few higher digits are hidden). The third disc is toothed, and has the numbers from 1 to 100 around its edge, inside the teeth. The fourth disc covers the third one, with one notch that reveals a number on the toothed disc. The fourth disc also has 100 holes around its edge. Just inside these holes is the fifth, top disc. It also is divided into 100 parts around the edge, marked in pen from 1 to 50 going counterclockwise on the right side, and from 1 to 47 going clockwise around the left side (a few divisions are unmarked). The first disc is intended to represent sums of numbers up to 100 (cents), and to carry a term to advance the third disc, which represents hundreds (dollars). The smallest disc can be used as a guide in adding or subtracting hundreds. Who was the inventor Thomas Strode? Thomas T. Strode was a heir 6th generation of the early settler George Strode from Millbrook, Hampshire, England. George Strode moved to Chester County, Pennsylvania about 1682 with his family. Many generations Strodes left their mark around West Chester. 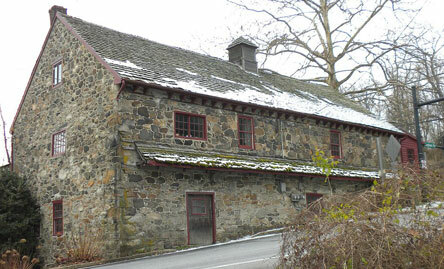 Strode's Mill, a property of Strodes from 1737 until 1878 is still preserved and is part of Strode's Mill Historic District, a national historic district located in East Bradford Township. Besides the Strode's Mill (see the lower photo), Strode's Mill Historic District includes Strode Farm, Strode's Pork Products plant, and other buildings. The parents of Thomas were William Strode (26 Dec. 1782—25 Dec. 1851), a farmer, and Elizabeth Strode (7 Jan. 1787—1 Apr. 1861). Thomas T. Strode was the second child in the family, born on 11 February, 1810, in Coatesville. He had an elder brother, Richard (1808-1848), and a younger brother and 5 sisters—Elizabeth (b. 1818), Ruthanna (b. 1820), David James (1822-1848), Mary Ann (b. 1825), Hannah (b. 1830), and Caroline (b. 1833). Thomas Strode worked as a storekeeper and farmer around Coatesville (in some of the patents he was specified as living in Mortonville, a hamlet near Coatesville). He must had been a very inventive man, because besides the three above-mentioned patents for calculating devices, he took out five other US patents—two patents for a calendar-clocks (US30166 and US49169), machine for boring holes (US8569), excavator (US152882), and grain winnower and weigher (US8763). Thomas T. Strode died on 19 March, 1880, in Newlin Township, PA.